During a visit to the Gaza Strip on Tuesday, United Nations’ Secretary General Ban-ki Moon voiced hope that Palestinians and Israelis will resume peace negotiations, soon. Meanwhile, in a conference in Cairo on Sunday representatives of more than 30 countries pledged billions of dollars in financial support to rebuild the war-torn Gaza Strip coastal enclave. In Gaza, the UN is still housing about 50,000 people who were displaced during seven weeks of violence this summer while thousands of residential buildings await reconstruction. Among the displaced, hundreds of families are sheltering in temporary metal sheds placed in their communities. 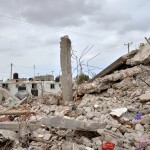 FSRN’s Rami Almeghari visited one of the devastated neighborhoods of Gaza and has the story. 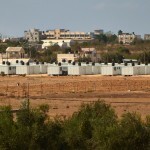 About 10 feet away from their battered neighborhood in the rural town of Kuzaa’ in southern Gaza, a total of 26 households of the extended Alnajjar family now live in temporary shelters made of corrugated metal. 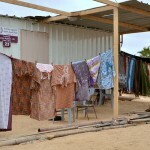 Neda’ Alnajjar lives in one of the metal-box shelters with her husband and three children. Alnajjar’s metal shelter, along with the many others in the area, was donated by the United Arab Emirates’ charitable works society. 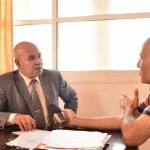 A local official in Khuzaa told FSRN that the number of metal shelters will soon increase to 100. Each shelter is just over 100 square feet in size and can accommodate up to six people. Khuzaa mayor Shehda Abu Rouk says that with no equipment or building materials, workers his jurisdiction are unable to rebuild. Last summer, the Israeli military offensive completely destroyed 450 homes in Khuzaa alone, displacing around 2500 local residents. A few hundred of them are among tens of thousands still taking shelter in UNRWA-run schools in nearby areas. Last month, Israel agreed to allow raw building materials and logistic supplies into the Gaza Strip under the supervision of UNRWA, the United Nations Relief and Works Agency for Palestine Refugees. On Tuesday, the first shipment of construction supplies including an estimated at 600 tons of cement, 50 truckloads of gravel and 10 truckloads of steel finally entered the devastated region. Also Tuesday, UN Secretary General Ban Ki Moon visited the region and saw the devastation first-hand. The 2009 violence the Secretary General refers to was another Israeli military action against Gaza during which some 1400 Palestinians and 13 Israelis died. This summer, Israel again launched a major offensive on the entire Gaza Strip killing at least 2100 Palestinian men, women and children, wounding about 10,000 others and internally displacing tens of thousands of people. Seventy Israelis, most soldiers, died. The war also left much of Gaza’s infrastructure either partially or completely destroyed. The 1.8 million inhabitants of the region still suffer from power outages of 12 hours each day, and access to potable water remains limited. While construction materials did begin to cross the border Tuesday, it remains unclear if shipments will freely continue or if they will flow at a rate sufficient to adequately rebuild. Click on any photo below to launch a slideshow. All photos by Shadi Alqarra.